A couple of days ago, I saw my classmate, Camille Yuga, eating green leafy vegetables over lunch. She was enjoying it. I asked her how she prepared the entire thing. She then gave me valuable pointers on keeping the lettuce fresh and choosing the right ingredients. This afternoon, after an Agape meeting, Tin Ang gave me tips on salad-making after she heard me say I wanted to make one. I learned about croutons, bacon bits, and vinaigrettes. She asked me if I was on a diet. "Not really," I said, "I just want my dose of fiber." The gist of the conversations I had with these women is that salad-making is easy; it's just a matter of mixing and matching. I hurriedly bought lettuce greens from the grocery and was surprised that they weren't that expensive—Php 50, and it already feels like you're going to eat a forest. After washing the greens in water, I tore the leaves with my hands; I read somewhere that slicing lettuce with knives would leave dark edges. 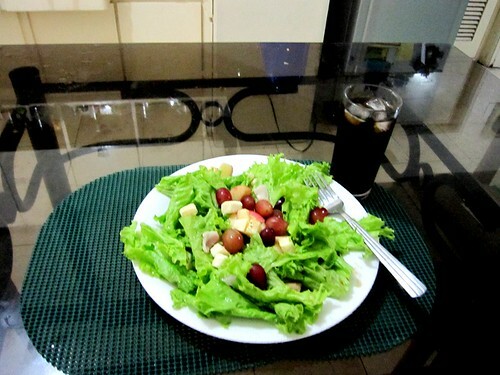 I added seedless grapes, diced apples, cheese, croutons, and lavished everthing with Italian herb vinaigrette. For protein, I added bacon which I shredded manually. 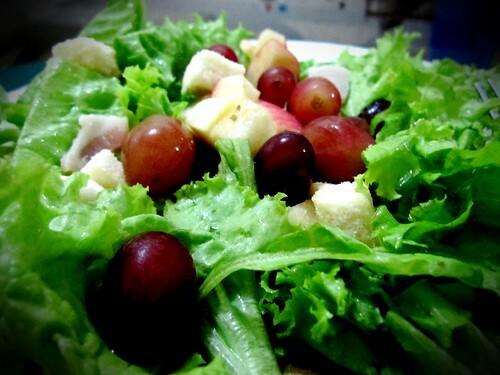 The vinaigrettes's sourness was neutralized by the sweetness of the grapes and apples. The croutons added to the texture. Not bad for a first time. Sadly I didn't have anyone else to share it with. My roommates all went home for the weekend. Now salad-making is technically not cooking which, by definition, is the preparation of food with the application of heat. But I used the microwave to cook the bacon. Technically, I applied heat. Technically, I did some cooking. If you have salad recipes you'd like to share, please drop me a line. The weirder, the better. I might just be the next Martha Stewart—but that's a long shot. I'm not a big fan of rabbit-food-laced-with-sauce myself. I like Big Macs better -- they're cheaper, more filling, and contain more essential nutrients, i.e., grease, grease and lots of grease. ;-) No wonder my gut never seems to shrink despite the miles I run every week. Jef, nutritionists say it's the grease that makes food delicious. Here's the rub: the more greasy, the more deadly. In your case, I suggest balance. Aace, what will I prepare next time? You tell me. You have the best baon in class. Tincee, I think I was being biased when I said that what I prepared wasn't "bad" for a first time. Haha. Who knows, Tin? One of these days . . .
sharp pictures lance, what camera do u use? Mai, for the record, no stomach aches on this one. It's a Canon Ixus point and shoot. It has automatic macro settings.